A filmographic pedant might insist that Robert Siodmak only made one movie called Criss Cross (1949), but that is a good general label for his entire oeuvre. The Dark Mirror (1946) is almost Bach-like in its play with symmetry and counterpoint – the film opens with credits over Rorschach-test inkblots, and a room with a broken mirror; ends in a room with a broken mirror, and “The End” imprinted on an inkblot. The plot concerns identical twins, one of whom may be a murderess, and the two men who try to catch them out. Motifs in the mise en scène extend the idea – from the obligatory omniscience of mirrors, to the patterning on the twins’ wallpaper and the print of a globe like splitting embryo in the doctor’s apartment. Scenes, characters and even stylistic elements (e.g. Rorschach-like face-to-face compositions) duplicate, parallel and reconfigure each other. Symmetry implies the classical ideals of balance and order, the very ideals that prevail in films concerned with identifying and expelling deviance. The film opens with a lingering snoop through an apparently empty, disordered room, as the camera approaches a cracked, web-like mirror, and finally stumbles on a corpse, stabbed in the back (1). The film ends with the (ambiguity-proliferating) mirror finally smashed, the guilty and innocent sisters separated, normality restored. The first room was an empty man’s apartment made chaotic and inexplicable by a woman. The last is that woman’s apartment filled with the men who have “read” the chaos (2). This ending is typical of those Hollywood films of the 1940s that popularised and misapplied Freudian ideas “to validate socially constructed modes of sexual difference which [were] already in place” (3), and The Dark Mirror, though a massive popular success, is a work that tends to be undervalued by Siodmak’s admirers. But there is a look given by the “good” sister, Ruth (Olivia de Havilland), in the film’s very last shot, seemingly acquiescing with the romantic hero, Dr. Scott Elliott (Lew Ayres), but insisting on private thoughts, that defies this resolution. For the first half hour, the viewer is as anxiously baffled as the investigating policeman, Lt. Stevenson (Thomas Mitchell) – first, at how someone as sweet and wholesome as Olivia de Havilland could possibly be implicated in murder; second, at the fact cast-iron alibis suggest she was simultaneously at the scene of the crime and four miles away from it; and third, when all seems to be clearing up, and the existence of an identical twin (de Havilland again) explains narrative discrepancies, at the inability to decide which is the guilty or innocent sister. There is a real frisson of disquiet in the first scenes of the sisters together, made a spectacle for witnesses, experts and judges: their “natural” relation seems an unnatural parody, as if they were Siamese twins at a carny (4). But too much ambiguity over which sister was which would be contrary to the clarity of classical Hollywood narrative, so various unsubtle means are employed to differentiate the pair – such as necklaces and brooches identifying their name (like labelled specimens, or insouciant Hester Prynnes); or their manner of being filmed, not just the weighting of light and shadow, but, for instance, in the use of point-of-view to evoke audience identification for Ruth in the Rorschach test sequence (suggesting the doctor’s greater emotional interest), after a more “objective” shooting (and sexualising) of a tight, black-top-wearing Terry (as in old-school Westerns, black and white clothing become another identifier of character). The fact that Dr. Elliott, with all the dull moral authority Ayres retained from playing Dr. Kildare, expresses preference for Ruth, is a mark in the latter’s favour. Olivia de Havilland, in playing both sisters, is more subtle than the Manichean ham of Bette Davis’ famous “double” roles (e.g. A Stolen Life [Curtis Bernhardt]), if not as enjoyable. As her name suggests, Terry is almost manly, assertive, playful, “smart” (in a film where female intelligence is synonymous with mental disorder). Her answers to the Rorschach test are supposed to reveal her as unfeminine, a man-hater, someone who sees men as threatening or violent (Michael Walker even suggests her as a closet lesbian (5)). One scene, where Ruth returns home after her first intimation of romantic feeling for Dr. Elliott, is framed by dissolves that superimpose the doctor on Terry in similar postures, and vice versa. But it would be wrong to characterise Ruth as simply “good” – despite the genuine warmth she reveals in her first scene, she has no problem visiting bachelors’ apartments at night (and various, comically-inflected witnesses let us know what they think of that), nor of using identical twinship to deceive others (it is under false pretences, as her sister Terry, that she is first introduced). For all its diversity, there are two main strands within first-wave film noir – the classic model in which a (usually average) man is tempted into crime and death by a femme fatale (e.g. Double Indemnity [1944, Billy Wilder]), Out of the Past [1947, Jacques Tourneur]); the second focusing on females-in-crisis, is in truth a hybrid of noir and the woman’s picture, and is something of a speciality of Mittel-European émigrés (e.g. Michael Curtiz’ Mildred Pierce , Fritz Lang’s Secret Beyond the Door  and Max Ophüls’ The Reckless Moment ). Siodmak, like his hero Lang, was adept at melding both sub-genres, and The Dark Mirror is an unsettling hybrid work (not least in its lurches from comedy to romance to horror). The Dark Mirror‘s focus is on the experience of two women, their struggles to earn a living, to deal with social disapprobrium and to live with sibling rivalry. Our access to this experience, however, is repeatedly blocked by male interpreters of their behaviour and character. These readings are mediated through various sciences, each found progressively wanting: ratiocination (the police investigation); forensic science; psychiatry. 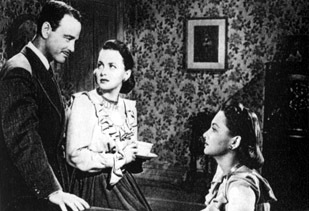 The latter is apparently successful in “unravelling this thing”, and yet is undermined throughout the film – by the patterning mentioned above, which allows alternative understanding of the sisters’ behaviour beyond the scope of medical or social orthodoxy; by the clouding of the doctor’s professional perspicuity because of emotional attachment, leading him to make questionable judgements (6); but mostly by strange intrusions into the narrative of the inexplicable. The trope of mirrors lead one naturally to considering various (psychoanalysis-derived) theories of spectatorship (a theme treated in many films by Siodmak, most famously in the opening sequence of The Spiral Staircase, 1945). But in The Dark Mirror, I think he reinstates some of the magic (or fetish, in the original meaning) properties associated with the motif. As a German, Siodmak had available to him a culture – literary, popular and scientific – fascinated with mirrors, threatened siblings/evil relatives, doubles, hypnosis, transformation and transference (e.g. Mozart, Hoffmann, the Grimms’ fairy tales [especially “Snow White”], Rank’s The Double , Freud’s “The Uncanny” , German Expressionist cinema). There are two extraordinary, parallel sequences in The Dark Mirror when apparently “normal” characters are persuaded into actions or attitudes by stronger figures with powers that are very close to mesmerism – when Stevenson wills Dr. Elliott into taking the case; more elaborately, when Terry tricks Ruth into thinking she’s going mad, staging lightshows to induce visual and aural hallucinations. The story of disparate male professionals grouping together to eliminate an “evil” woman and save a tainted but essentially “good” one echoes Bram Stoker’s Dracula (1897) (illegally adapted as Nosferatu by F.W. Murnau , for whom Eugen Schüfftan, uncredited creator of The Dark Mirror‘s special effects, worked; Siodmak’s first notable feature in America was Son of Dracula ) (7). The inkblot behind Siodmak’s director credit resembles a bat; Terry, in black, flinches from the light Dr. Elliott shines on her; later, she rises like Max Schreck in her bed to terrorise her sleeping sister. These horror/fantasy echoes (including the old “superstition” about abnormality and twins, dismissed by the doctor, but affirmed by the film) serve to critique the more sinister “psychology” lurking underneath the screenplay’s pop variant, with each sister representing various aspects of the duty/desire conflict in one person – such a narrative might concern not the elimination of a social transgressor, but the taming of an essentially decent woman’s wayward impulses (e.g. to promiscuity). As the film reaches its climax, a rotten trick is played on the villainess, the hero and the audience. This is achieved by withholding information (that Ruth is still alive), just as it is “information” that prevents us from “reading” the two women, and solving the puzzle set in the opening sequence. Cornered, Terry babbles that she is Ruth. This could be the last desperate trick of a mad, bad woman, but she really does seem possessed, like Norman Bates at the end of Psycho (Alfred Hitchcock, 1960), as if some transference (through the mirrors?) has occurred. It is this profound anti-rational streak (and dubious doctors and scientists appear throughout his work) that Siodmak inserts into a story celebrating the triumph of rationality and social order, undermining science’s insistence on patterning behaviour, locking individuals into pre-ordained destinies like characters in a genre film. Dr. Elliott’s scientific explanations, like those of Hitchcock’s Dr. Richmond, ring hollow in the face of Ruth’s closing, unknowable look. Disarrangement of time and space is signified by the attenuated ticking of a clock, and an overturned lamp; that it is a male space is shown by (two) statues that are mirrored in the décor of the hospital. Each of the three professional men’s spaces (the policeman, judge and doctor) is defined by books or writing. Mary Ann Doane, “The Clinical Eye: Medical Discourses in the ‘Woman’s Film’ of the 1940s”, Poetics Today 6.1/2 (1985), p. 213. When it is revealed in passing that the twins were clinically examined as children, I was reminded of Mark’s traumatic exposure to his father’s camera when a boy in Peeping Tom (Michael Powell, 1960). Michael Walker, “Robert Siodmak”, The Movie Book of Film Noir, ed. Ian Cameron (Studio Vista, London, 1992), p.126. Deborah Lazaroff Alpi says Dr. Elliott’s meeting the twins outside his office is unethical and reckless. Ayres brings to the role not just the reliable Dr. Kildare persona, but also his more ambiguous, real-life status as a conscientious objector during World War II, which made him a Hollywood pariah; further, Dr. Elliott’s sweet-sucking, like that of the murderer in Georges Simenon’s Maigret (1934), is an indication of character weakness. Alpi, Robert Siodmak: A Biography, with Critical Analyses of His Films Noirs and a Filmography of All His Works (McFarland & Co., Jefferson, 1998), pp. 150, 321.